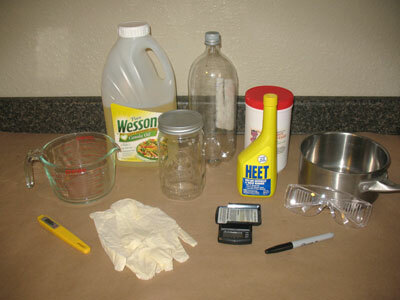 Using this 1-liter biodiesel recipe is a great way to become familiar with the process of making biodiesel. It will be pretty cheap, using many easy-to-find supplies. This recipe calls for new oil, so you won’t even have to calculate how much catalyst to use! 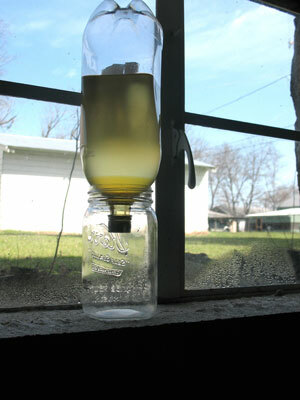 After you've mastered this, learn to titrate so you can make your own biodiesel using WVO! To use this recipe using WVO, be sure to de-water the oil, and use your titration results to determine the about of catalyst needed. •	200 ml of Methyl alcohol also known as methanol (yellow bottle of HEET). This can be bought at your local automotive store, or Walmart. •	7.5 grams of potassium hydroxide (also known as KOH. It will dissolve much faster than lye). ...OR 5.5 grams of lye (also known as sodium hydroxide and NaOH). You may be able to find sodium hydroxide at a hardware store. It is used as a drain cleaner. Check the bottle of drain cleaner to make sure it is pure - you need 100% NaOH. To purchase these chemicals, try calling chemical supply stores (chemical section in the phone book). If all else fails, you can easily find them on line but you'll have to pay a premium to have a chemical shipped. •	Funnel (chemical will be poured through it). Or follow the directions to make your own. •	Scale accurate to 0.1 gram. Use a liquid measuring cup and measure 200 ml of water. Pour the water into an old glass jar (should have a lid to go with it). 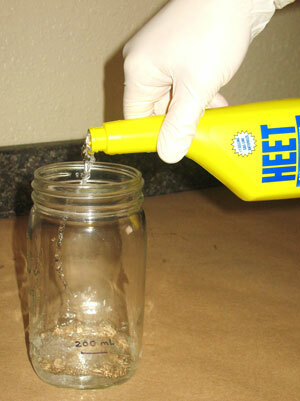 Use a sharpie to draw a line on the outside of the jar where the water rests. 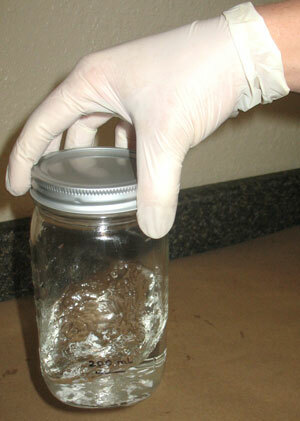 Dump the water out and dry the jar thoroughly. Measure 1 liter of oil and add it to the pan. 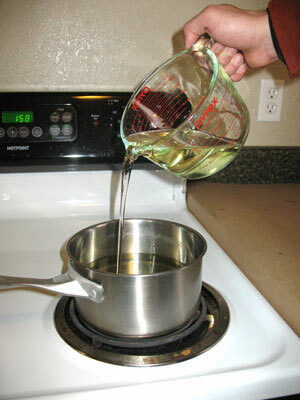 Begin heating the oil on low in a pan while you measure the other stuff. Measure out 200 ml of methanol using a graduated cylinder and add it to the mixing jar. 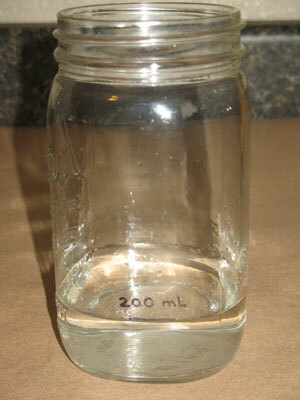 If you made your own 200 ml measure, measure it in the jar. 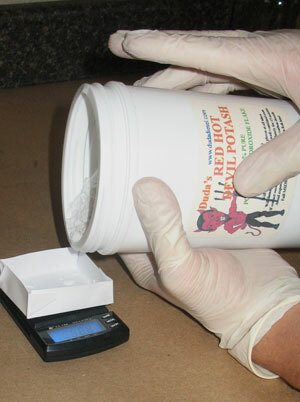 Weigh out 7.5 grams of potash or 5.5 grams of lye. If you have an electronic scale, put the tray on first, press the TARE button - this will zero the scale - then measure the catalyst. Add the catalyst to the jar of methanol. Tighten the lid thoroughly and swirl it until all the catalyst is dissolved. Bring the oil to 130°F. 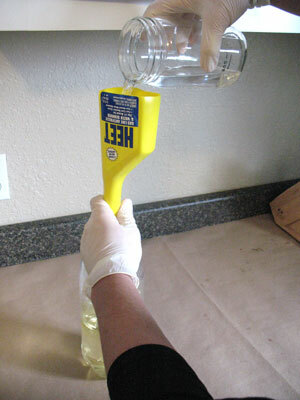 Using the funnel (see picture below for instructions on making a funnel from the HEET bottle), pour the heated oil into the 2-liter bottle. 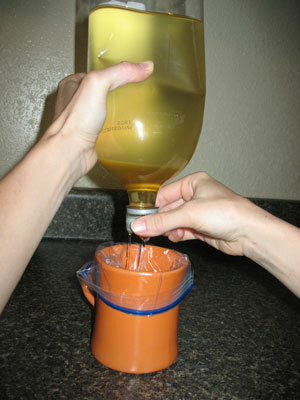 Use the funnel to add the dissolved methanol mixture to the bottle as well. 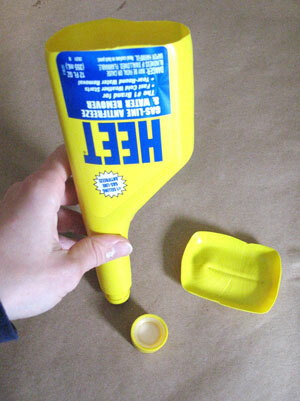 To make your own biodiesel funnel, dispose of any remaining HEET (or add it to your car). Cut the bottom off the bottle, and take the cap off. The opening of the bottle fits well into the top of the pop bottle. Put the cap back on the bottle and screw it on very tight. Shake it up vigorously for about 5 minutes. 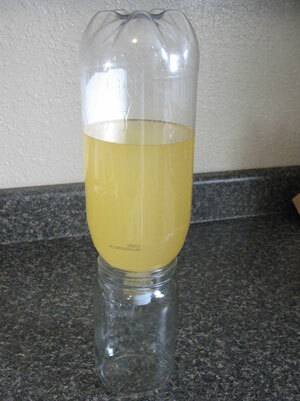 Let the 2-liter bottle sit upside-down for 24-48 hours. The glycerin will settle in a layer on the bottom, the biodiesel on the top. Gently squeeze the bottle, while slowly unscrewing the lid a bit while it is still upside-down. 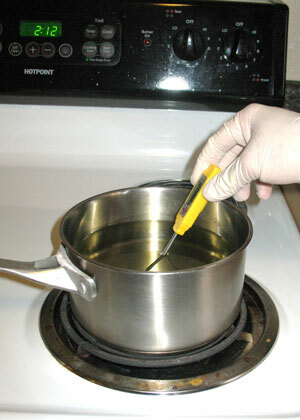 Continue applying a steady pressure until the entire bottom layer of glycerin is drained. *Steady pressure is important. 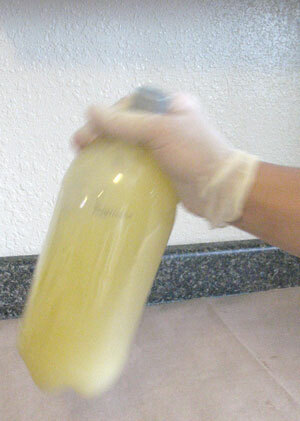 If you let off the pressure, it may allow air into the bottle, remixing the contents. Now all that's left is the top layer - biodiesel! 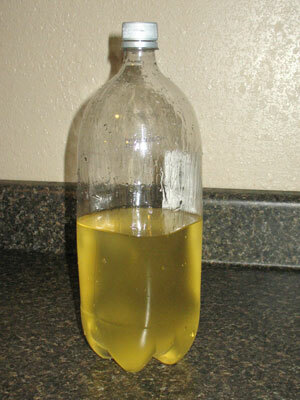 After completing this biodiesel recipe, you will be left with a low-quality biodiesel. This low-quality fuel will run in your diesel engine, but it will create build-up over time. In order to make it into a high quality fuel, you will need to wash it to get the remaining glycerol and other impurities out. Instructions are on the following page.